I was on JetBlue yesterday morning without headphones, but CNN was on the TV and the following question (or a reasonable facsimile) flashed across the screen: Is Splenda bad for your health? And I silently mouthed "NOOOOOO!" Not my favorite calorie-free sweetener! Then I read about it in today's New York Times, and discovered that the new research CNN was talking about is not necessarily the death knell of Splenda. Apparently Duke University conducted a study that showed that Splenda "contributes to obesity, destroys 'good' intestinal bacteria and prevents prescription drugs from being absorbed. "Uh oh, the Splenda-philes are thinking. But here's the catch: the study was funded by the Sugar Association, aka "the lobbying group for the natural-sugar industry and a chief competitor to and legal adversary of Splenda," the Times reports. Curious! This isn't the first time a much-beloved by and marketed-to women product has come under scrutiny. Below, some beverages, drugs, and makeup that turned out to be less than female-friendly. Tab: While Tab is still on the market, it had to change its formula several times, and still has a cancerous taint about it. First, because it used a combination of cyclamate and saccharine, which was shown to cause bladder cancer in rats and created malformed chicks. So Tab was reformulated with saccharine alone…until Congress required Tab to put a warning label on its products that said "may cause cervical cancer" in the early 80s. This enforced labeling was repealed in 2000, but today, Tab, which contains a combination of saccharine and aspartame, flies mainly under the radar but for a few outspoken enthusiasts. Makeup: Earlier this year, the state of Minnesota banned mercury from mascara, eyeliner, and skin-lightening creams. Federal law allows up to 65 parts per million of mercury in these products, but apparently those hard frozen asses up in MN won't let that fly. "Mercury does cause neurological damage to people even in tiny quantities," Minnesota State Senator John Marty told CBS News. Also, remember all those lipsticks found to have lead in them earlier this year? Watch your faces ladies! Pills: Until they were banned in 1979, many, many women were basically using amphetamines as diet aides. Other weight loss drugs that were totally dangerous and eventually banned by the FDA include Dinitrophenol and Fen-Phen. Even more famous was Thalidomide, which was meant to control pregnancy symptoms like morning sickness, but actually contributed to many, many birth defects. See, Splenda doesn't seem so bad now, right? Destroyed stomach enzymes, here we come! 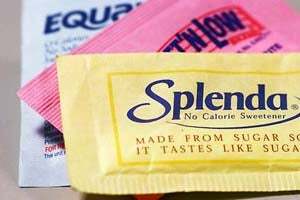 New Salvo in Splenda Skirmish [NYT] The Bitter Truth About a Sweetener Scare [WSJ via Junk Science] Tab Scare [New Yorker] Minnesota Bans Adding Mercury To Cosmetics [CBS News] Earlier: Is Your Lipstick Poisoning You?